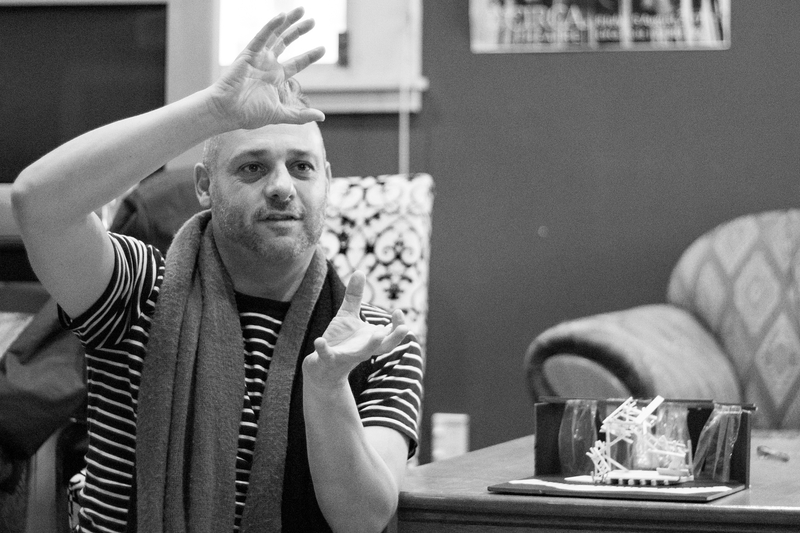 As both Set and Costume Designer, Ian Harman is responsible for creating the striking visual world of A Doll’s House. Below he explains his production concepts and process. I absolutely adored Emily Perkins’ take on A Doll’s House. 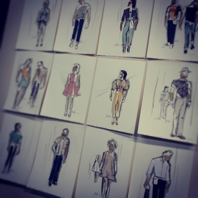 I wanted to set it very “now” so the immediacy of the work could come through. I wanted to create a space of movement and unrest, one that was unnerving and delicate. 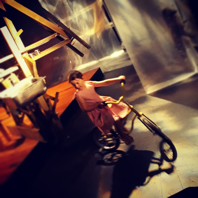 The set uses saw-horses, scaffolding planks and good old 4×2 to create a tornado like arch that delicately hangs over the actors’ playing space. 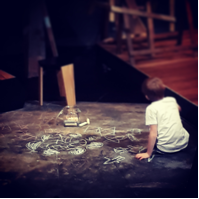 It creates a sense of unrest and chaos; of what it is like to live in a building site and graphically portrays the fragility and spiralling turmoil of Nora’s world. It feels it could all come crashing down at any second. I chose light coloured Sunkist wood, and faded pastel tones (based on a faded Tip Top ice cream sign) as small accents of colour to give us a hot summery New Zealand feeling. I loved the juxtaposition of all of this dark drama against a summery palette. The use of the builder’s plastic helped to give us “outdoor’ space, silhouette work for Nora’s fears, and a beautiful effect of the world crashing down around us as Nora leaves the space at the end of the play revealing the theatre in its naked and tattered glory as she pushes out through the back wall of the theatre into the night streets of Wellington. The lighting designer Marcus McShane masterfully used these curtains in the Christmas morning sequence when the children are seen riding their bikes through the plastic and around the set. It is filmic, surreal and utterly breathtaking. The costume design used a lot of blue to evoke a little of the plays Nordic origin as well as popping beautifully against the tones of the set. The Christmas day scenes were monotone with Nora and the children being the only colour, using subtle reds and tangerine to bring summer and festivity to the scenes. I also wanted Nora to “pop” and to always be seen. At the very last minute we changed the dress that Nora wore in the last scene. What I wanted from the dress was to keep flicking Nora from child to woman, that as she was chastised we could see the child Theo thought she was to seeing her transform into the woman she becomes as she realises she has to leave. I chose a Blue floral dress that was simple and chic and fitted her like a glove, It grounded her and helped the focus immensely. I also wanted to have some references back to its original Nordic heritage as well: Nora’s hair in a plait, the use of soft Nordic blues and bleached wood, and a Scandinavian nod with the Christmas crowns they wear on Christmas Eve. 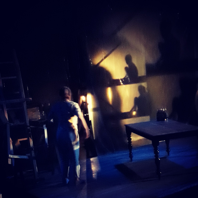 The whole process for me was one of slow restraint, adding each subtle detail so as not to overshadow the beautiful writing, direction and performances but to enhance and support the fragile word in which A Dolls House is set.